"In his eyes was the hunted look of a beast seeing some gap in the ring of his enemies. He licked his lips with a long pale tongue." Mini Horses – so exactly what are they? A major misconception harbored by many people is that these furry little animals are ponies – not true. In fact, miniature horses are just what their name suggests: horses, only in miniature size. These dwarfed animals can range from 28 to 34 inches, but any exceeding that height are considered ponies. 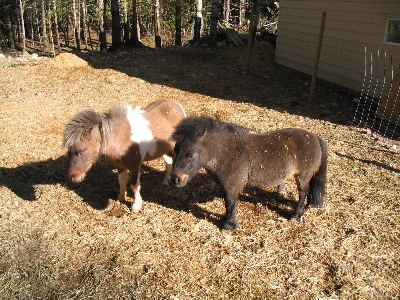 Due to their small size, miniature horses cannot be ridden (unless you happen to be a hobbit! ), but they can provide enjoyment for their owners in many other ways. Besides making fantastic pets, they can also be shown (the American Miniature Horse Association holds an annual show in Texas), drive carts (these amazing little animals can pull up to 700 pounds! ), and even be trained to act as “guide horses” for the blind. Miniature horses also take a lot less space (they can even live in a normal-sized back yard) and food than regular horses, and can be hardier as well. All they require is a small shelter during foul weather, and this can be as simple as putting a tarp over a makeshift wooden frame. Feeding-wise they are quite easy-keepers, and actually can cost less to feed than a large dog! 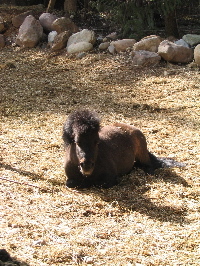 Like full-sized horses, mini horses need a supply of hay, pellets, and grain. Exactly how much you should feed your mini depends on the horse’s individual needs and what kind of food you are providing. Prospective owners should research food and nutrition thoroughly before buying their mini, as it is important to realize that these horses are very different from large horses in that respect. However, as a rule of thumb, more frequent feedings of smaller amounts is most healthy for all horses. And remember: don’t over-feed. Mini horses love to eat! Finally, how can you exercise your mini horse? These animals, like other horses, need plenty of exercise to keep them in tip-top shape. This is perhaps even more important for this type of horse, because miniature horses are notorious for easily gaining weight. However, there are many things you can do to help them remain in a healthy shape. Lunging your mini horse is one very effective way. This can be done on a lead line or in a circular corral. This is also a good time to practice jumping; try putting little jumps in for your horse to go over. This will build stamina and muscle, which is important if you planning to try carting with your horse. And don’t underestimate these little guys – miniature horses are known to jump their own height! Carting is also a great way to exercise your horse – going out for a drive keeps him healthy and is enjoyable for you. Finally, if you’re into a more moderate approach, try taking your horse for walks. 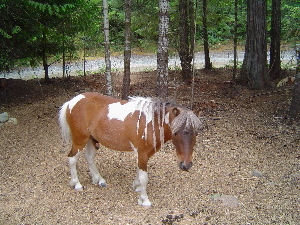 Mini horses are small enough to be walked easily, much like a large dog, and can make excellent hiking companions.